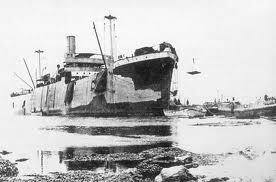 1st Battalion War Diary: "Remained on board preparing for disembarkation." steamer with two masts and a yellow funnel. Slung over her starboard side were half a dozen men on ropes, painting that side of the ship yellow. Her name was the River Clyde (soon to be carved into infamy. See here - in part from the 1931 movie "Tell England" - for the reason ed). A space near the bow still remained to be coloured. That evening General Birdwood, with his Chiefs of Staff, moved into the battleship HMS Queen, and General Bridges and his Staff into the Prince of Wales." 23rd April, 1915. S.S. "Arcadian." Lemnos. A gorgeous day at last; fitting frame to the most brilliant and yet touching of pageants. All afternoon transports were very, very slowly coming out of harbour winding their way in and out through the other painted ships lying thick on the wonderful blue of the bay. The troops wild with enthusiasm and tremendously cheering especially as they passed the warships of our Allies. Nunc Dimittis,(from the opening words in the Latin Vulgate, "Nunc dimittis servum tuum, Domine" - "Now thou dost dismiss thy servant, O Lord" ed.). O Lord of Hosts! Not a man but knows he is making for the jaws of death. They know, these men do, they are being asked to prove their enemies to have lied when they swore a landing on Gallipoli's shore could never make good. They know that lie must pass for truth until they have become targets to guns, machine guns and rifles—huddled together in boats, helpless, plain to the enemy's sight. And they are wild with joy; uplifted! Life spins superbly through their veins at the very moment they seek to sacrifice it for a cause. O death, where is thy sting? O grave, where is thy victory? 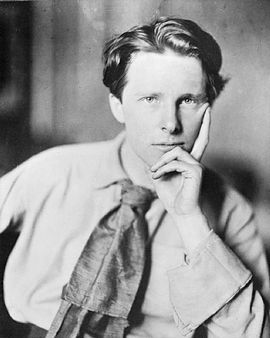 A shadow has been cast over the wonders of the day by a wireless to say that Rupert Brooke is very dangerously ill—from the wording we fear there can be no hope. Dent, principal Naval Transport Officer, left to-day to get ready. Wemyss said good-bye on going to take up command of his Squadron. Have got d'Amade's revised orders for the landing at Kum Kale and also for the feint at Besika Bay. Very clear and good. At 7.15 p.m. we got this message from K. (Lord Kitchener, ed.) - "Please communicate the following messages at a propitious moment to each of those concerned. (1) My best wishes to you and all your force in carrying to a successful conclusion the operations you have before you, which will undoubtedly have a momentous effect on the war. The task they have to perform will need all the grit Britishers have never failed to show, and I am confident your troops will victoriously clear the way for the Fleet to advance on Constantinople. (2) Convey to the Admiral my best wishes that all success may attend the Fleet. The Army knows they can rely on their energy and effective co-operation while dealing with the land forces of the enemy. (3) Assure General d'Amade and the French troops of our entire confidence that their courage and skill will result in the triumph of their arms.
" Personal: All my thoughts will be with you when operations begin." We, here, think of Lord K. too. May his shadow fall dark upon the Germans and strike the fear of death into their hearts. I have sent orders to all Admirals that operations are to proceed and they are to take the necessary measures to have their commands in their assigned positions by Sunday morning, April 25th! I pray that the weather may be favourable and nothing will prevent our proceeding with the scheme. 'May heaven's light be our guide' and God give us the victory. Think everything is ready and in some ways the delay has been useful, as we have now a few more lighters and tugs available. (Sd.) J. M. de Robeck." Your note just received gives expression to my own sentiments. The sooner we get to work now the better and may the best cause win. Rupert Brooke is dead. Straightaway he will be buried. The rest is silence. Twice was "the sight" vouchsafed me:—in London when I told Eddie I would bespeak the boy's services; at Port Said when I bespoke them. Death on the eve of battle, death on a wedding day—nothing so tragic save that most black mishap, death in action after peace has been signed. Death grins at my elbow. I cannot get him out of my thoughts. He is fed up with the old and sick—only the flower of the flock will serve him now, for God has started a celestial spring cleaning, and our star is to be scrubbed bright with the blood of our bravest and our best. Youth and poetry are the links binding the children of the world to come to the grandsires of the world that was. War will smash, pulverise, sweep into the dustbins of eternity the whole fabric of the old world: therefore, the firstborn in intellect must die. Is that the reading of the riddle? Meanwhile, the best of many nations - "the flower of the flock" - await their destiny!